As a former chef and pastry chef, people always ask me what is my favorite restaurant, what is my favorite food, what do I like to cook, etc. I am also asked what is my favorite cookbook or what cookbook should they buy as a gift? With over 500 cookbooks in my library it’s never an easy answer. However, there are three cookbooks that I cook from consistently: Basic to Brilliant Y’All by Chef Virginia Willis, My Key West Kitchen: Recipes and Stories by Chef Norman Van Aken and Classic Home Desserts by Richard Sax. What I love about each of these cookbooks is that they all have recipes that are easy to make, are typically dishes that I don’t have with any regularity and have great stories behind them. 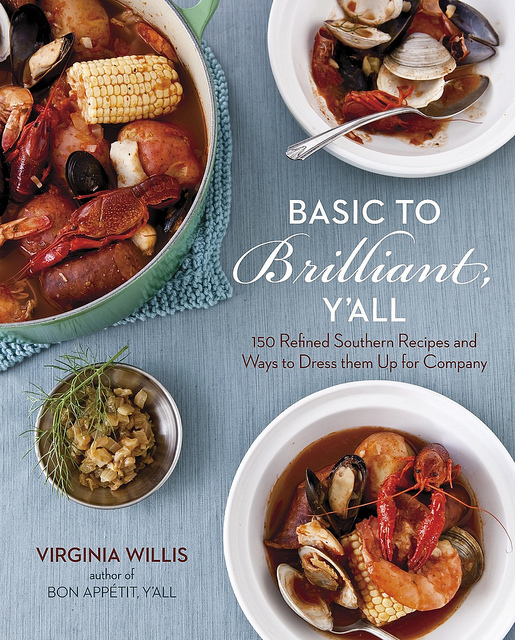 Atlanta chef, cookbook author and teacher Virginia Willis’s second cookbook, Basic to Brilliant Y’All is nothing short of… well, brilliant. What makes this Southern-French cookbook, which reflects her Southern roots and French culinary training, brilliant is found right in its title. Willis fills 288 pages with 150 delicious southern recipes and not only refines them, but also offers ways to add additional ingredients, presentation styles or techniques to the base recipe. The 12 chapters cover everything from Fundamental Recipes and Starters and Nibblers to Daily Bread and Desserts. There are a number of dishes that I love to make including Apple Roquefort Turnovers, Crisp Roasted Duck with Peach Barbecue Sauce, Charleston She-Crab Soup and Sweet Potato Grits. 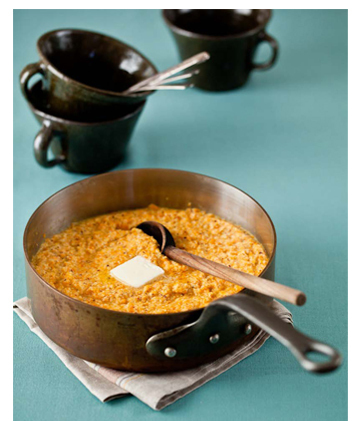 For Virginia’s Sweet Potato Grits recipe, click here. Sundays, for me, are Pancake Day and most Sundays that means Sweet Peach Pancakes. Below is Virginia’s recipe for this easy, foolproof Sunday favorite. Directions: Combine the milk, egg and butter in a large liquid measuring cup. Add the wet ingredients to the dry ingredients and whisk just until combined. 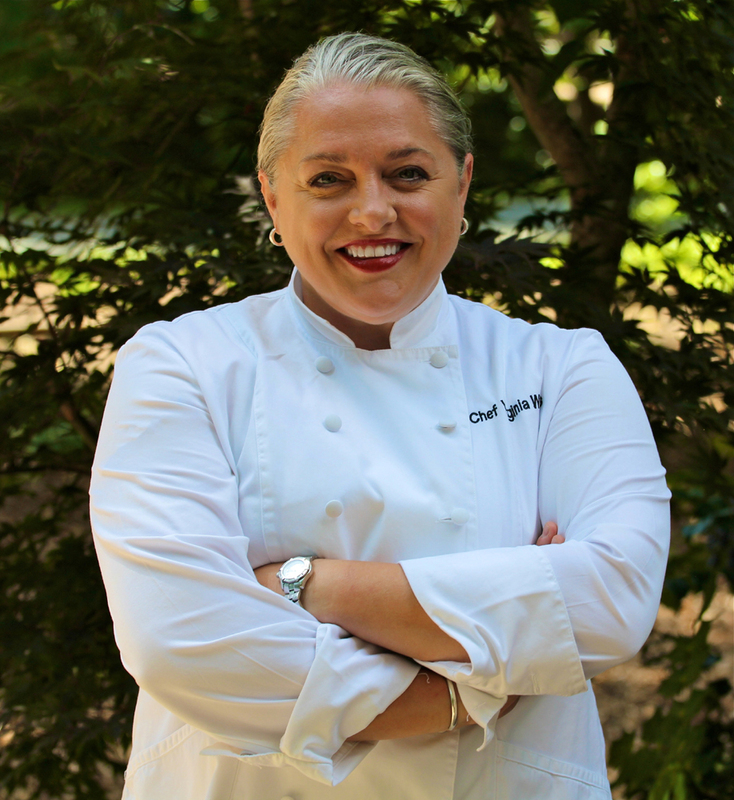 For more information about Chef Virginia Willis, please visit www.Virginiawillis.com. 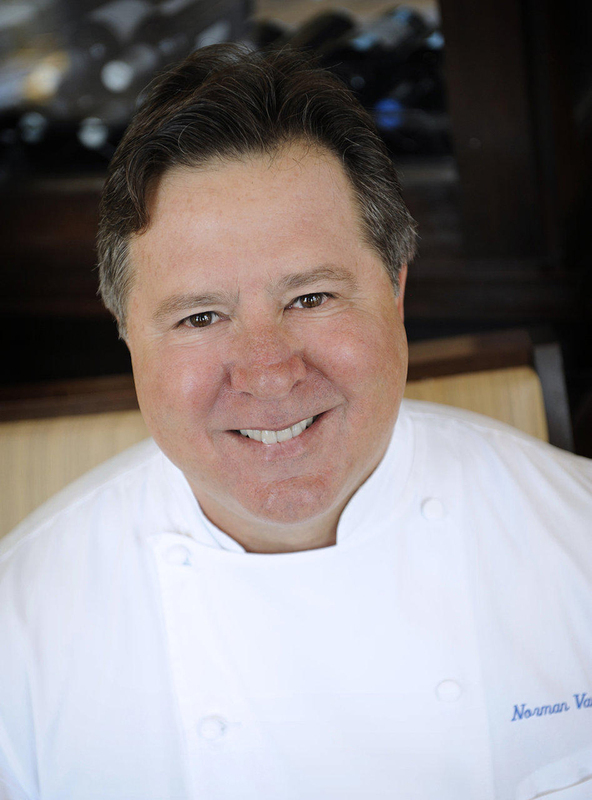 Known as the Father of New World Cuisine, Chef Norman Van Aken has been one of my favorite chefs for many years. He is a chef, restaurateur, author of five cookbooks and the only Floridian included in the James Beard list of “Who’s Who in American Food and Beverage. Although he was born in Illinois, if you want to know what “Florida Cuisine” is then look no further than Van Aken. 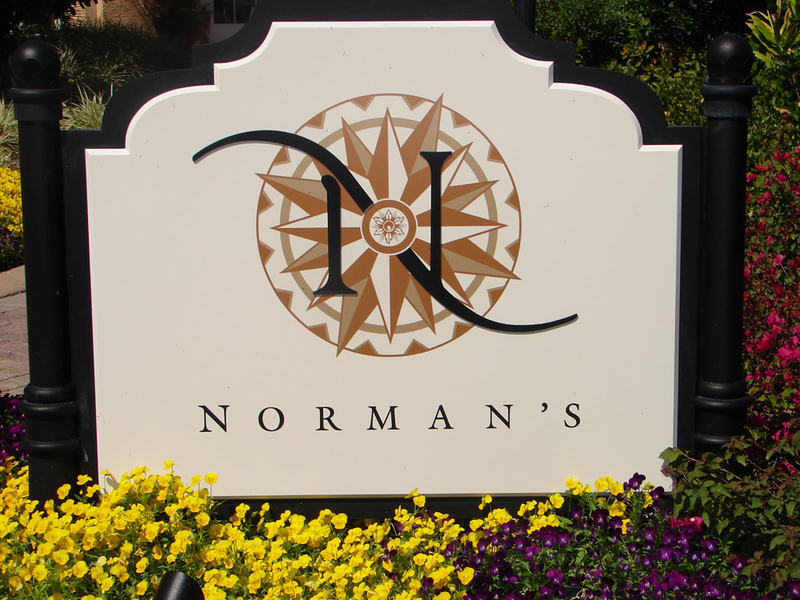 For those who vacation at Walt Disney World, the next time you visit, travel outside the Disney “bubble” and head over to The Ritz-Carlton, Orlando, Grand Lakes and dine at Van Aken’s restaurant – Norman’s. 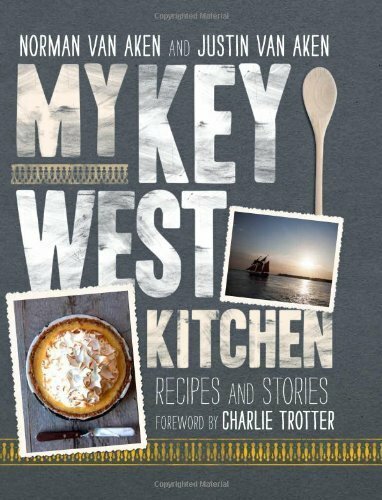 In the meantime, check out Van Aken’s latest cookbook, co-written with his son Justin, My Key West Kitchen: Recipes and Stories, and you’ll discover some great dishes that truly are a culinary love letter to Key West. The beginning of each chapter is a memoir from both Norman and Justin about the area, the people and the food of the area. The recipes that follow correspond to the theme of the chapter. Some of my absolute favorite recipes are Green Parrot Fried Chicken and Waffles, Forbidden Fruit Cocktail, Tamale Scramble with Chorizo and Jack Cheese and probably the best (and ultimate) key lime pie – Sunshine’s Key Lime Pies. Once you make this key lime pie you will never want another. Weekends were made for, among other things, cocktails. 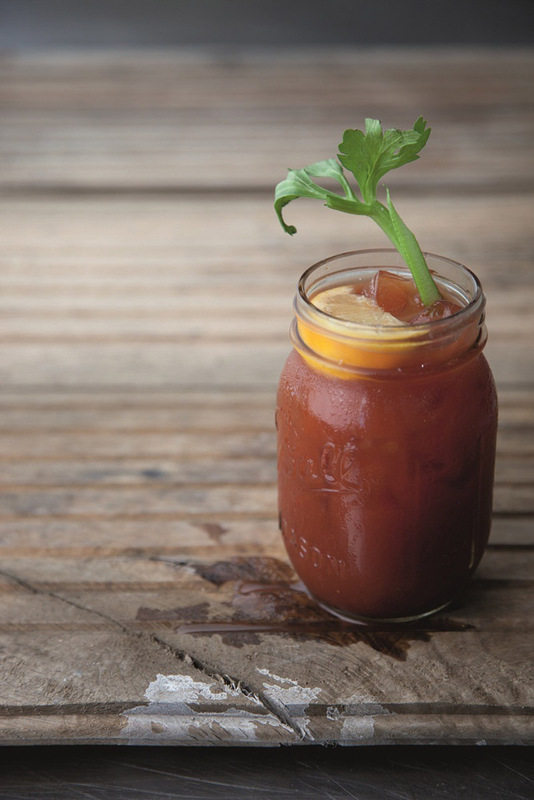 And the Bloody Mary is probably one of the most popular brunch cocktails. Norman and Justin feature a bloody Mary in their cookbook that must be tried. It also has a great name, “Woman Gone Crazy” Bloody Mary. Place a few ice cubes in a cocktail shaker. Add the vodka, tomato juice, Tabasco and pickapeppa sauces, celery salt, lemon juice, vinegar, a pinch of salt and a few grinds of black pepper. Shake well. Strain into a pint glass filled halfway or more with ice cubes. Garnish with a lemon wedge and celery stalk. Makes one cocktail. (Reprinted with permission). *Pickapepper sauce can be found in specialty food shops and online. Basic to Brilliant, Y’All and My Key West Kitchen were published in 2011 and 2012, respectively. 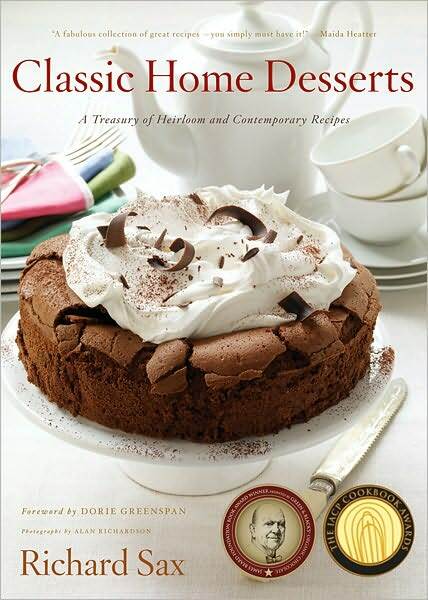 My third favorite cookbook, Classic Home Desserts written by Richard Sax in 1994, is still the quintessential cookbook on heirloom and contemporary desserts from around the world. One cookbook author described Classic Home Desserts as “worth its weight in gold!” And with 19 chapters the 688 pages cover everything a cook could want: cobblers and crisps, cakes and cookies, puddings and soufflés, pies and pastries, ice creams and sauces, as well as extensive sidebars of information, that description is right on the money. Because this cookbook is so extensive picking out a favorite recipe is almost impossible. However, I have made almost every coffee cake recipe including the Quintessential Coffee Cake, Brown Butter Coffee Cake and the Hotel Cipriani’s Coco-Swirled Vanilla Breakfast Cake are standouts. The World’s Best Lemon Tart is exactly that… the world’s best. Richard has a delicious Italian Ricotta Pudding cake that is light and not too sweet – perfect anytime. When I worked in guest relations at a Philadelphia four-star, four-diamond hotel years ago, I would work in the pastry shop on the weekends. One of my primary responsibilities was to create all the sweets for the afternoon tea and petite fours for dinner service in The Dining Room. Almost every miniature cookie I made for tea and dinner service came from this cookbook. The were a few cookies that became very popular with the guests including food writer M.F.K. Fisher’s Ginger Hottendots, a small, slightly chewy, bursting with ginger-flavor cookies. Licorice-flavored New Mexico Anise Christmas Cookies paired perfectly with strong teas in the afternoon and after dinner with black coffee. My personal favorite cookies were the Tennessee Moonshine Cookies, a moist cookie with whiskey-infused fruits, and Ruth Wakefield’s Original Toll House Cookie. According to Sax, “Nestle still owns the exclusive rights to the Toll House trademark… Once their original contract ran out, Nestle changed the recipe very slightly. This is Mrs. Wakefield’s original.” Click here for the recipe. Give these cookbooks a try. I guarantee you that you will love having these books in your collection and will use them on a regular basis. Happy cooking! This entry was posted in Foodie Recipes, Foodie Tales and tagged Apple Roquefort Turnovers, Basic to Brilliant Y’All, Bloody Mary Recipe, Brown Butter Coffee Cake, cakes and cookies, Charleston She-Crab Soup, Chef Norman Van Aken, Chef Virginia Willis, Classic Home Desserts, cobblers and crisps, Crisp Roasted Duck, Daily Bread and Desserts, easy to make recipes, former chef, French country dishes, Fundamental Recipes and Starters and Nibblers, Hotel Cipriani’s Coco-Swirled Vanilla Breakfast Cake, ice creams and sauces, M.F.K. Fisher’s Ginger Hottendots, My Key West Kitchen: Recipes and Stories, New Mexico Anise Christmas Cookies, pastry chef, Peach Barbecue Sauce, pies and pastries, puddings and soufflés, Quintessential Coffee Cake, Richard Sax, Sweet Peach Pancakes, Sweet Potato Grits, Tennessee Moonshine Cookies, The Essential New York Times Cookbook, Three Must-Have Cookbooks for any Cook by Chuck Mirarchi. Bookmark the permalink. Originally from Philadelphia and now living in New York City, Chuck is passionate about many things that oddly enough work together perfectly. He is a former pastry chef, worked in a number of four- and five-star hotels and is currently a publicist and has been a lifelong Disney fan. As a kid he even went on a local Philly quiz show where his area of expertise was Walt Disney. When Chuck isn’t going to a cabaret show, a museum, seeing a Broadway show or checking out one of the many restaurants and food shops in New York City, he loves to spend time home cooking and baking, as well as traveling. 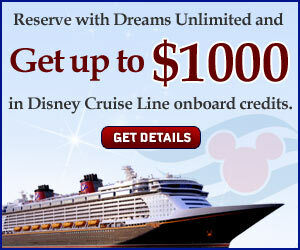 His favorite destinations are Paris, London, Las Vegas and of course Walt Disney World and Disneyland.